Well, I’ve been in a holding pattern the past few days on the Asanuma base plate. Need to get out in the cold and buy some parts for the mounting system. The plate itself is dimensioned and milled. Just need to get to Ace for hardware. And, while at Ace, I’ll be picking up parts for the long-mothballed Seneca View 8×10 project camera. When the Asanuma base plate is done, the work ceases until the bellows come in. Unfortunately, I haven’t sent the original ones off to Sandeha yet. I’m the bottleneck. So, I have to move on other projects. A beautiful Eastman Empire State #2 whole plate view camera, complete with extension rail, sliding tripod block, and just about everything it needs. 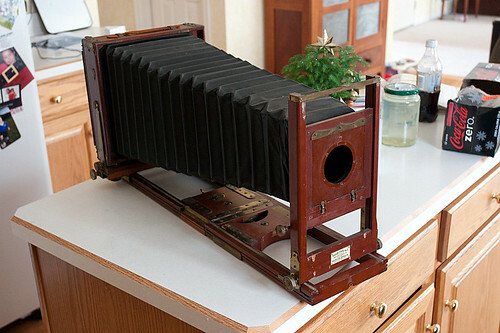 Just some minor repairs and TLC for this one – new ground glass, some rail work, refinish, polish the brass. And a new handle. ‘Cause I need more projects. I was hoping to get some advice. What do you think is a good finish for wood used in a camera that is going to be used outdoors? On my current project I have been using a linseed oil and bees wax 50/50 mixture but am now thinking it is not robust enough, esp for against water. I am considering spraying varnish after reading about it here, but have two concerns from my inexperience. Will it crack with wood movement and also make everything bigger dimensions. The second concern is will it adhere to wood already treated with some wax. What do you think, I would appreciate any advice you might have?